Drew Sandy Brown Nubuck. 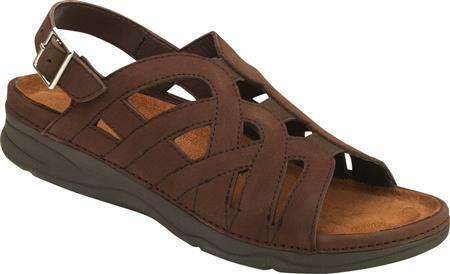 The Sandy is an comfortable orthopedic sandal that accommodates custom orthotics, comes in many sizes and widths and features a Steel Shank. The New Drew Sandy sandal offers the lightweight comfort provided by a removable, soft cork footbed with memory foam and the added support of a flexible, shock-absorbing EVA outsole. Stretch gore vamp and back buckle add to its customizability. The footbed is removable making the Drew Sandy one of the industries only double depth sandal- ready for custom orthotic, while full leather linings and a natural, oblique toe make the Sandy one of our best-selling sandals. Click to see all the Drew Sandy colors.